Continue reading "Accessibility Testing Tools"
Day 2 – Use a tool like WAVE to scan a web page for accessibility problems. 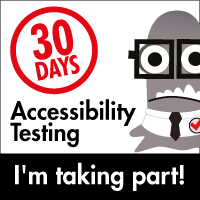 Continue reading "Day 2 – Use a tool like WAVE to scan a web page for accessibility problems." Continue reading "Welcome to My New Blog"
Continue reading "Day 1 – Diversity of Disabilities and The Effects of Aging "
Continue reading "Accessibility and UI Trends"
Continue reading "30 Days of Accessibility Testing – My Challenge Journal "